Clear party tents are always for special events because of its royal and luxurious look. The pure style and appearance makes it the most preferred choice to celebrate valuable moments. 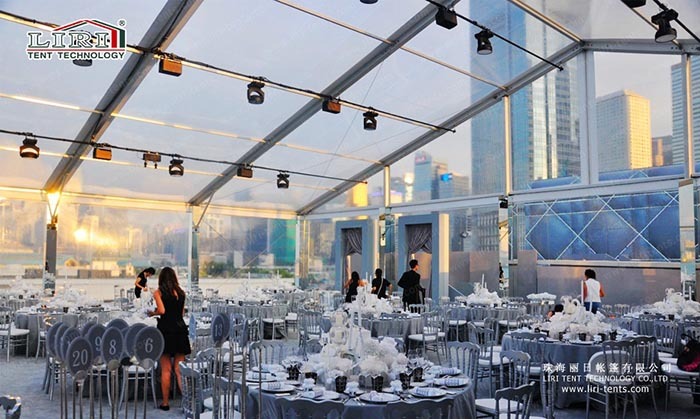 Nowadays, the clear party marquee comes in different styles and shapes, making it more glamorous and charming. If you want to hold your party at beach, grass land, or a place under the sky, a clear roof party tent will enable you to enjoy a remarkable scene. These clear tents are the best choice to make your outdoor event outstanding from others. It brings you fantastic memory at your special moment. You won’t miss bright stars and moon when you enjoy party in the transparent tent at night. So plan your next party in the transparent party tents to make every second of the party memorable. If you want to know more about this clear party tent, just SEND your detailed product inquiry. We will get back to you as soon as possible. We are the first and largest party tents manufacturer in China.